The gay alt-right troll set up a Patreon page to fund his “magnificent 2019 comeback," but the site yanked it down in less than a day. On the heels of news that gay alt-right troll Milo Yiannopoulos is $2 million in debt and was forced to return his wedding ring to Cartier to help cover the cost of what he owed the luxury jeweler, his plan to pay for his lifestyle via crowdfunding was derailed in less than a day when Patreon kicked him off the site saying that it does not associate with “hate groups,” according to The Hill. “I’ve had a miserable year or two, banned and de-platformed and censored and blacklisted ... and now I need your help. I want to get back on my feet and come roaring back in 2019 with the fabulous comedy and insightful, serious commentary that made me famous in the first place,” Yiannopoulos wrote on his Patreon page. But Patreon yanked the page, along with the perks, in less than 24 hours. “Milo Yiannopoulos was removed from Patreon as we don't allow association with or supporting hate groups on Patreon,” the company tweeted Wednesday, linking to the site’s community guidelines. “Be respectful of the people and communities on Patreon. People are different. That’s what’s beautiful about the internet and creativity: communities of varying types can assemble and flourish. We want Patreon to be an intimate and safe venue for a diverse range of creators and their communities,” the site's community guidelines read. The former golden child of Breitbart, who rose to fame for terrorizing Ghostbusters star Leslie Jones on Twitter, was finally booted from the alt-right site for comments he made that appeared supportive of pedophilia. He also lost a book deal and has been turned away from speaking gigs. 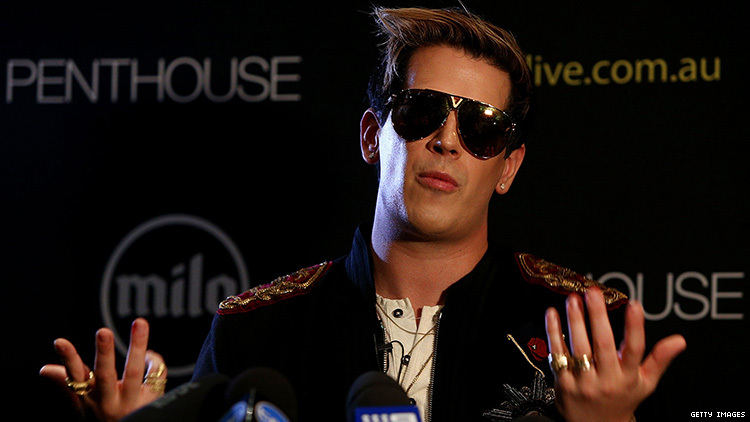 Documents obtained by Yiannopoulos’s Australian tour promoters that were released earlier this week show that he owes $1.6 million to his own company, $400,000 to the billionaire Mercer family, more than $76,000 to Breitbart writer Allum Bokhari, and $20,000 to Cartier. He also owes thousands to far-right writers like the anti-Islamist Pamela Geller and to science fiction writer Theodore Beale (Vox Day). “I am less financially secure, more panicked and stressed, and more miserable than when we started," wrote to his Australian tour promoters Ben and Dan Spiller. He also informed them that he was forced to return his wedding ring to Cartier to help shore up that debt.